Paternity exclusion studies provide useful information for testing certain theories of behavioral ecology and for the management and conservation of both wild and captive populations of endangered species. This study used eight human nuclear microsatellite loci, in the absence of species-specific PCR primers, to genetically identify the sires of 12 captive lowland gorillas (Gorilla gorilla gorilla) and 2 captive orangutans (Pongo pygmaeus pygmaeus andPongo p. abelii). Parentage assignments were confirmed by excluding all except a single potential sire for each offspring with the least two loci. Sire-offspring relationships were verified in 12 of the 14 cases, and reassigned in the case of two gorilla offspring. The orangutan paternity typing was supplemented by DNA fingerprinting. Additionally, five of the eight microsatellite loci, in conjunction with behavioral data, were used for a non-exhaustive set of paternity exclusions for five wild mountain gorillas (Gorilla g. beringei). 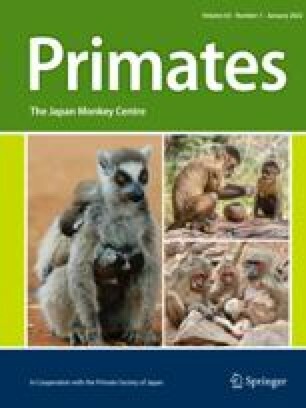 The eight loci described in this study should be useful additions to the tools available for the study of genetics in the great apes.